Need ideas for a 1st birthday cake for an upcoming party? Here are a few 1st birthday cake’s we have created recently. The first cake is yellow with a blue dinosaur for a little boy. 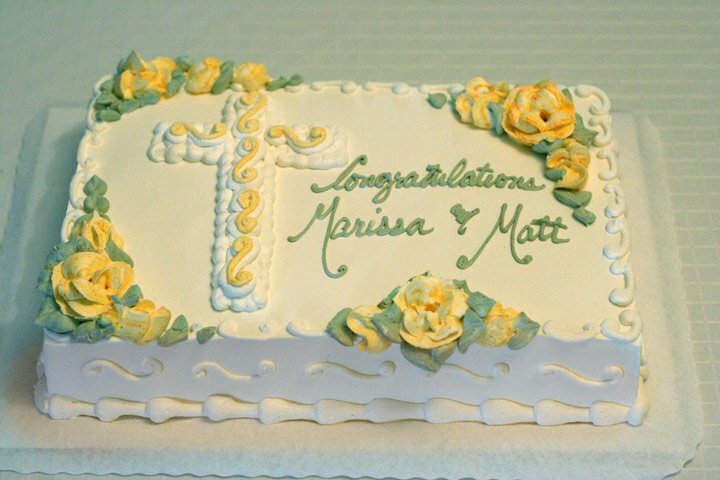 The cake was decorated to match the invitation. It was a smaller cake, made to serve 15 people. It’s flavor was white cake with raspberry & bavarian custard filling. The second 1st Birthday cake was for little girl in Yorba Linda, CA. Round with a pink and white colored outside, and a red velvet with cream cheese filling inside. This first birthday cake was chocolate with cookies ‘n cream filling for a party in Brea, CA. Decorated with a monkey theme complete with bananas and green plants this cake was sure to be a hit. Bigger than a cupcake yet smaller than a dessert cake these birthday cakes are the perfect size any baby’s first birthday. Pink and blue with a simple design these cakes are ready to be eaten, thrown, and dismantled by little hands. After all what fun is eating cake with a fork? This third sheet cake was for the celebration of a First Holy Communion and Confirmation completed at St. Juliana Catholic Church in Fullerton, CA. The cake flavor was white and chocolate marble with cookies ‘n cream filling, topped with beautiful flowers made from icing. This traditional 3-tier, white wedding cake was delivered to Calvary Orthodox Presbyterian Church in La Mirada, CA. We positioned it on a gorgeous stand, raised high on pillars, opening plenty of space for fresh flowers. From the bottom-up the flavors consisted of chocolate with chocolate mousse filling, followed by applesauce spice with cream cheese in the middle, and red velvet with cream cheese filling on the top layer. This past weekend, we delivered this gorgeous, 4-tier, stacked wedding cake to Strawberry Farms Golf Course in Irvine, CA. Like a kid in a candy store, the bride wanted more than one flavor baked into her wedding cake. We divided each cake layer into two flavors; The top 2 layers were white chocolate marble and red velvet with cream filling. The third layer to follow was lemon and chocolate with cream filling, and the bottom was chocolate marble and red velvet with a filling of bavarian custard. Without question, surfing is a popular sport in Orange County. We have beautiful weather and amazing beaches. 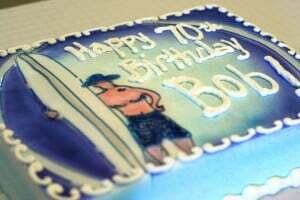 So whether it’s your 7th or 70th birthday, a surfing birthday cake is just plain cool. Once this “dude” bottom-turns his fork into this chocolate cake with strawberry and cream filling, we know he’ll be smiling like he just caught an epic wave.